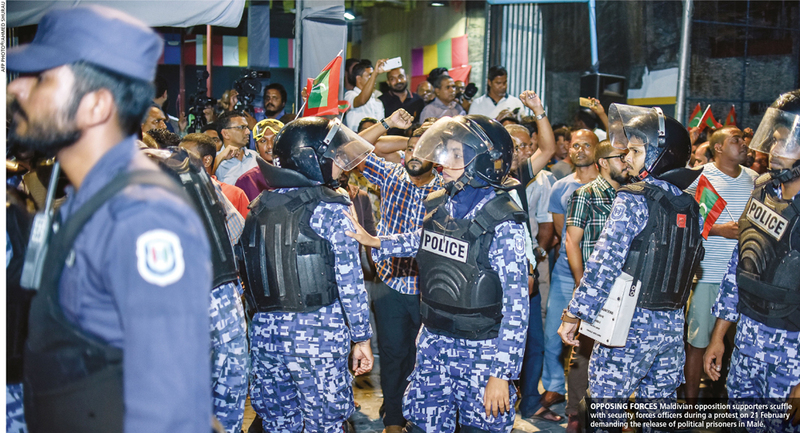 The timing set off alarm bells since this naval movement came as the Maldives was thrust into yet another tense political situation. Although the fleet was over 3,500 kilometres away from the atolls, the Indian press interpreted the Chinese action as a subtle shot across New Delhi’s bow. The saga began on 1 February when the Maldivian Supreme Court declared that eight individuals including former President Mohamed Nasheed, former Vice President Ahmed Adeeb and six other high profile persons had received unfair trials, and should be released immediately. President Abdulla Yameen was having none of that and stood his ground – he sacked two police commissioners, and the military stormed the Supreme Court, arrested two judges including the chief justice, and a new bench rescinded the order to release the prisoners. Nasheed is in exile, shuttling between Colombo and the UK but travelling on a British passport. A state of emergency was imposed in the Maldives, first for 15 days and extended by 30 days. Soon after the troubles began, Nasheed went public requesting Indian military intervention to overcome the chaos – not the wisest public utterance for a leader in waiting and as expected, New Delhi did not react. The Indians did request Yameen not to extend the state of emergency but this entreaty was ignored. China has major investments in the Maldives – among them the expansion of the international airport. Ironically, under Yameen, the airport development contract was to be handed to an Indian company before China moved in. There is also speculation that during his presidency, the legal barriers to foreigners owning land was relaxed in a move squarely aimed at allowing more Chinese investments. The Maldives has tilted acutely towards China. Like with Sri Lanka, Chinese President Xi Jinping has forged close relations with Yameen and when the current political turmoil took root, Beijing said it wouldn’t support any foreign intervention in the Maldives. The movement of the fleet was thus interpreted as being part of this promise. However, Western diplomats based in Colombo remained noncommittal on the fleet movement and did not consider it a major incident. Despite the US, UK and EU taking a tough stand against Yameen, their actions have been reserved to words and travel advisories. It appears that they were waiting for India to act but New Delhi didn’t take an assertive stance… at least in public. This is most certainly not 1988; not the time for ‘Operation Cactus,’ which was the code name used for the Indian military intervention in the Maldives when a coup attempt was launched using Sri Lankan-Tamil mercenaries belonging to PLOTE. Three decades on, regional geopolitics have changed but some of its repercussions could prove costly. The Maldives has been simmering for some time since late 2012, when Nasheed – the country’s first democratically elected leader – resigned and was replaced in 2013 by Yameen. In 2015, Nasheed was found guilty on terrorism charges and sentenced to 13 years in jail. Out on bail in 2016, he fled to the UK and has been living there since. Scores of his supporters and members of the Maldivian Democratic Party (MDP) are either in jail or in exile with many of them using Sri Lanka as their base. The February ruling by the Supreme Court appeared to catch the government by surprise. But the tense situation that prevailed on the atolls, which are home to a population of less than half a million people, was evident well before that. It was as if the people were waiting for something to transpire. There are also indications that the Yameen government has been aligning itself to a conservative streak of Islam with Saudi Arabia at the helm. Last April, Yameen Rasheed – a liberal blogger who had been critical of the president – was stabbed to death outside his apartment in Malé. The murder drew international condemnation but the subse­quent investigation has been slow. In August 2014, his friend and journalist Ahmed Rilwan went missing from a ferry station. Both cases have been linked to extremists who openly threatened the two. However, no substantial progress has been made by the police. The government has hinted at a conspiracy. Following the arrest of ex-president Abdul Gayoom – the man who ruled the Maldives for three decades and is the half-brother of the incumbent president – the government claims it suspects large sums of money to have exchanged hands before the initial Supreme Court decision. There is more trouble on the horizon with elections due this year. As things stand, Nasheed cannot throw his hat in the ring for the presidency but the original Supreme Court decision that made his conviction void did in fact clear that path. His camp believes that if the ruling had been implemented, there would’ve been a chance of him returning to the islands to champion Yameen’s ouster. For the time being, the Maldives will simmer while India and China watch from the sidelines. Both have shown their cards but it remains to be seen if the diplomatic face-off will turn into a real show of power.